You are browsing the archive for Autostart (Persistence). This is yet another feature of Windows. This time it is a configuration settings for Event Viewer. When you open the program via eventvr.exe/msc it will launch the mmc.exe which in turn will load an Event Viewer snap-in. The Event Viewer allows to view the system / application logs that we all should be familiar with. When the link is clicked, the mmc.exe will open a default help Microsoft link which will be rendered by the currently set up (default) browser. The MicrosoftRedirectionURL can be changed to e.g. file://c:\windows\system32\notepad.exe, or MicrosoftRedirectionProgram can point to the executable directly. One can also tinker with the command line parameters e.g. in a combo with a lolbin. And that’s it. Plus, it’s time for a small bonus. While I was playing around with Event Viewer, I noticed that it uses Richedit control to render the data it shows. One of the features of this control is that it is automatically recognizing URLs embedded inside the data. As such, it highlights them and make them clickable. A malicious user could inject a malicious link pointing to a full path on a disk into the logs (e.g. 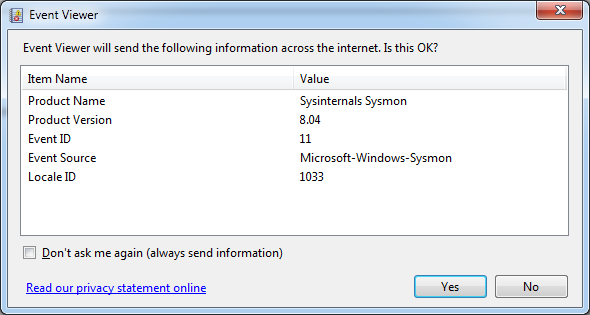 if sysmon is logging, or 4688+cmd line logging is enabled), and then make the richedit convert this path into a clickable link. When I posted this discovery on Twitter, it got immediately evilriched by Brent Muir, who asked if it could be used as a privilege escalation. This was confirmed by me and Csaba Fitzl in the same thread. Thanks to everyone who chipped in on that thread.